You can’t get to Germany’s OktoberFest? 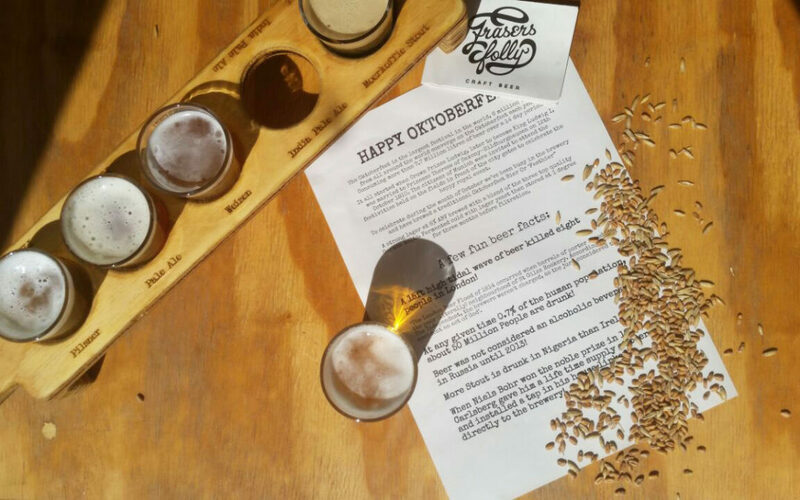 Not to worry; we’re bringing OktoberFest to the Overberg, creating our own Fraser’s Folly Festbier. True to its tradition, our Festbier is a strong Märzen-style Lager (5.2% ABV), brewed with 3 different German malts, and aged for 3 months at just 1 Degree Celsius. That’s just how things were done at the original OktoberFest – first held in 1810 in Germany, when Crown Prince Ludwig I of Bavaria married Princess Therese of Saxony-Hildburghausen, and all of Munich was invited to attend. Back in those early days, they had to do things a little differently, to ensure the beer didn’t spoil. Like only brewing during the cold months – with the Märzens brewed in March (März in German); and making the beer a bit stronger, so it could last longer. Our OktoberFest Lager also matches up to the original in terms of taste: toasty rich, but still very smooth. And look out the for the Märzen colour – that copper colour it’s so known for. But the Fraser’s Folly Festbier is only available till the end of October from the Black Oystercatcher Farm; and at the OktoberFest celebrations in Struisbaai. We’ll be joining the BeerFest at the SeaShack in Struisbaai on Saturday, 7 October. Pouring our Festbier (and other favourites) from 11 am onwards. The deal? R150 gets you in, with a mug, and a beer. And don’t forget the entertainment – with Bierfest Band Wurstzipfel. For more info on the BeerFest, check out www.seashackstruisbaai.co.za.